Thomas Charles Fenton was the son of James Fenton of Loversall and Grinton who married Thomasina Ibbetson of Denton Park . He was one of ten children, his elder siblings were Thomasina, Jane, Mary Anne, Isabella ( Bell ) and William Carr Henry; his younger siblings being Harriet, Elizabeth, George and Edward. Thomas Charles Fenton was born in 1790 and became a Cornet at the age of fourteen in the 4th (Queen’s Own) Dragoons by purchase on 13 November 1804 and rose to lieutenant in the same regiment on 22 July 1806 and captain by purchase on 2 January 1812. As such Fenton sailed to the Peninsula in 1809 and saw action throughout the war, at Talavera, Busaco, Usagre, Albuera, Villagarcia, Salamanca, Vitoria and Toulouse. 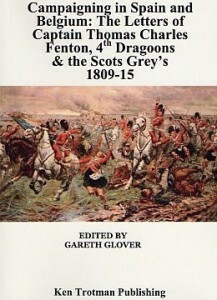 Returning home in 1814, Fenton went on half pay, but transferred to the 2nd (Royal North British) Dragoons, or Scots Greys and commanded a troop at the Battle of Waterloo. Despite all these adventures Fenton miraculously came through these campaigns without wound or serious illness, a fortunate man indeed, or was it his hardy Yorkshire upbringing? Fenton married Harriet Rooke in 1817 and retired from the army in 1819, living at Stroat House, Tidenham, near Chepstow. The couple had at least one son, Charles Hamilton Fenton who married Mary Isabella Salmon in 1846. With all the Peninsula memoirs being uncovered; is there anything unique about Fentons letters? The simple answer is yes, very much. Despite having served with Wellingtonthroughout almost the whole of the Peninsular War, virtually nothing is known of their service, because no memoir of this regiment has ever been published previously. It therefore pains me to mention that I have in my possession transcripts of two sets of letters from this regiment, the second set being that of Fenton’s friend and colleague Lieutenant Norcliffe Norcliffe, whom I have been able to use to verify facts and also to quote sparingly to flesh out incidents briefly mentioned by Fenton. Unfortunately however, the owners of Norcliffe’s letters have declined all requests to publish the letters in full. It is hoped that they will reconsider this decision in due course.